Robin Lindley (robinlindley@gmail.com) is a Seattle writer and features editor for the History News Network. His writing—often interviews of writers, scholars and artists—also has appeared in Crosscut, Writer’s Chronicle, Real Change, The Inlander, NW Lawyer, and other publications. When Franklin D. Roosevelt was elected president in 1932, the United States faced uncertainty and imminent peril at home and abroad. The unemployment rate was 25 percent. Systems of credit and banking were broken and the stock market had lost 80 percent of its value since the 1929 crash. Factories were abandoned. Thousands of families lost their homes. There was no social safety net for millions of impoverished men, women and children. At the same time, liberal democracies struggled as brutal dictatorships in Germany, Russia and Italy flourished, and some Americans feared complete disintegration of the social order and revolution. 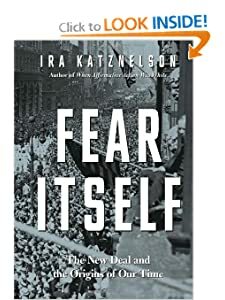 In his new book Fear Itself: The New Deal and the Origins of Our Time (W.W. Norton), acclaimed historian and political scientist Dr. Ira Katznelson documents how fear and uncertainty shaped a fragile democracy when “the most constant features of American political life continually threatened to become unstable, if not unhinged.” New Deal legislation energized the country and thwarted anti-democratic impulses, but -- as Dr. Katznelson details -- these laws passed because southern Democrats aligned themselves with more liberal Democrats only on the condition that the racial hierarchy of the seventeen segregated states was preserved. In his original, global history, Dr. Katznelson examines the New Deal and collective fears that persisted from 1933 through the administration of President Harry S. Truman and the conclusion of the Korean War in 1953. In exploring fear in our politics, he reviewed much of the House of Representatives and Senate legislation from the period, and focused on the influence of Southern Democrats on every major law introduced during these two decades -- and the consequent sad compromises to rescue an imperfect democracy and assert global power. Dr. Katznelson is Ruggles Professor of Political Science and History at Columbia University and president of the Social Science Research Council. Formerly, he taught at the University of Chicago, chairing its department of political science from 1979 to 1982, and at the New School for Social Research, where he was dean of the graduate faculty from 1983 to 1989. He was president of the American Political Science Association for 2005–2006. A few of Dr. Katznelson’s previous books include Black Men, White Cities; Race, Politics, and Migration in The United States, 1900-30 and Britain, 1948-68; City Trenches: Urban Politics and the Patterning of Class in the United States; Marxism and the City; Desolation and Enlightenment: Political Knowledge After Total War, Totalitarianism, and The Holocaust; and, in 2005, When Affirmative Action was White: An Untold History of Racial Inequality in Twentieth-Century America. Robin Lindley: There must be hundreds of books on the New Deal. What sparked Fear Itself and your original examination of the New Deal? Dr. Ira Katznelson: There were two different motivations. One was present-oriented and one was historically-oriented. The present-oriented motivation concerns the relationship between fear and democracy, which ever since 9/11 has been an apparent and powerful theme in our political and social life. I thought to look to the New Deal as a moment when the country faced not just one kind of fear but layers of fear. Economic fears. Fears of dictatorship. Fears of violence, and the like. So the first motive was to assess how our democracy dealt with fearful situations without sacrificing constitutional procedures. The second motivation is historical. Mainly, I came to think that the hundreds, even thousands, of works on the New Deal, had missed some important features of the period that shed light on fear and democracy. These features included the time frame of the New Deal, the global location of the New Deal, the role of Congress, and within Congress, the role of the American south. By shifting vantage of inquiry to include those four elements, I thought it would be possible to look at and see a familiar object in new ways. Stop much earlier. Most histories of the New Deal stop on the eve of the Second World War or sometimes through the Roosevelt years. The Truman Fair Deal period is ordinarily considered separately. I put the full period together for three reasons. The first is very straightforward. Harry Truman was Franklin Roosevelt’s last vice president and would not have become president if not for President Roosevelt’s decision-making. So there’s something incomplete about leaving his years out of the story. Second, by extending, we can see more clearly the full period as an age of fear beginning with the collapse of market capitalism in the Great Depression which occurred simultaneously with the challenge of new kinds of mass dictatorships in Rome, Berlin, and Moscow, followed by the unprecedented violence of the Second World War culminating in atomic weapons and the discovery of the Holocaust, followed by the Cold War and the possession of atomic weapons by both the Soviet Union and the United States, followed by and ending the period with the Korean War. Each of these sources of fear was dramatic and new. We never experienced threats to capitalism quite like this. We never faced dictatorships quite like these. We never had this level of violence or threat of annihilation. Each of these sources of fear reminds us that fear is different from ordinary risk. Fear consists of circumstances in which it is difficult to impossible to understand the parameters of risk. The third reason for extending through the Truman administration is that by doing so we can see an outcome, an object of analysis coming into view that we otherwise would not see: namely the creation of a two-side, new national state that only took full form by the end of the Truman years. The first side of this Washington-based national state was primarily was domestic. With the growth of the importance of the federal government, many claimants and new interest groups came to Washington and played a competitive game that was rich with procedures but thin on public interest. At the same time, we developed a new national security state -- what I call in the book a crusading state -- that was strong on public interest, fighting for democracy and against dictatorship, but weak on procedures, so that ordinary democratic politics did not condition the way in which the national security state proceeded. We cannot see those outcomes, which the book seeks to explain, unless we treat the full twenty years of Democratic Party rule. That’s a creative approach to the period. You’re a political scientist and I wondered how your approach might compare with that of a historian. Actually, I’m a Ph.D. in history with appointments in both political science and history at Columbia, but most of my career I’ve primarily taught political science. But it’s still a good question because I have a hybrid background. I say in the book that it’s neither traditional political science nor traditional history. If I had to point to the deepest inspiration for this book, it goes back to something I learned in my fourth year of undergraduate studies doing a senior-year essay with the great historian Richard Hofstadter. It was Professor Hofstadter who first put in my hand an essay he wrote, published in 1955, in the volume The Varieties of History edited by Fritz Stern. It’s an essay on history and the social sciences. In that essay, Hofstadter calls for a new genre of history that would maintain the narrative force and literary quality of history while drawing more fully on tools from the social sciences. He called that approach analytical history. When I wrote this book, I tried to bear that call of Hofstadter’s in mind. I think of this book as an attempt at writing analytical history. You do an excellent job of describing the character of fear in the 1930s, and I think younger readers in particular may be struck by the threats to democratic government and how some American leaders believed that totalitarian governments like those in Germany, Italy and Russia might better deal with the challenges of the time. I don’t think that American democracy was about to collapse or was going to decay quickly under the emergency, but I do argue -- to remind readers -- that, as President Roosevelt was coming into office, not just the enemies of democracy but many friends of democracy in the United States, including leading journalists like Walter Lippmann, argued that it would be necessary for the president to take uncommon actions, perhaps even suspend the ordinary procedures of Congress to meet the test of the emergency. I argue in Fear Itself that the leading achievement of the New Deal is that never happened. Congress remained intact. Even the  Hundred Days key legislation was affected by Congressional preferences. And Congress, even at the height of President Roosevelt’s popularity after his re-election in 1936, was capable of saying no to the president when it disagreed with him. This was an enormous achievement. The reference to the possibility of rule by executive power and temporarily suspending the legislature was not an abstraction for Americans in the early 1930s. Mussolini had asked Italy’s parliament in 1922 to pass an enabling act to transfer legislative power to the executive. And three weeks after President Roosevelt was inaugurated, the Reichstag voted to give such executive power to Hitler’s cabinet. So this issue was in the air, and gives all the more reason to admire the way in which the New Deal confronted the largest problems of the day without losing the separation of powers and without Congress losing its capacity not only to make law but to say no to the executive branch when it wished to. And we had 25 percent unemployment then and fears of revolution. Yes, and 25 percent unemployment then was actually much worse than it would be today because most women were not in the wage labor force. Well over 40 percent of the American adult population had to grapple with the emergency without a wage coming in. So there was a profound, deep crisis, and it occurred simultaneously with the challenge of the dictatorships that claimed the capacity to solve problems better than the liberal democracies. They argued that they had more capacity to solve those problems precisely because they did not have to answer to the polarized and divided politics of legislatures. Your book is very moving on what you call the “southern cage” and FDR and the Democratic Party’s Faustian bargain with southern Democrats -- to preserve white supremacy and segregation laws in order to pass New Deal legislation. I think the level of racism and oppression in the south may stun some younger readers. We might begin by recalling that in the 1930s and 1940s -- before the 1954 Brown v. Board of Education decision -- we had seventeen states in the Union, not just the eleven that seceded during the Civil War, but seventeen states that mandated racial segregation. Not one representative from those states, ranging from the most racist like Theodore Bilbo of Mississippi, to the most liberal and not racist like Claude Pepper of Florida, ever opposed racial segregation in this period. So you had seventeen states, thirty-four United States senators and a disproportionately large House of Representatives delegation because seats are apportioned on the basis of population not voters, and this was a period when the South had a very low turnout, low franchise electorate. There were rules like the poll tax and literacy tests to keeps black from voting, and those rules also kept many whites out of the electorate. So you had a small electorate, a one-party system and therefore great seniority for Southern members of Congress with control over key committees and legislative positions of leadership -- that is, disproportionate power. And the Democratic Party in this period -- the agent of the New Deal in Congress -- was composed of a strange-bedfellows alliance of a Northern, principally immigrant, Catholic and Jewish, big-city, labor-oriented political base, together with a Southern, largely non-immigrant, non-urban, mostly Protestant, rural base. They could not have been more different in those respects, yet together they composed the Democratic Party. To secure party majorities for New Deal legislation, it was necessary to keep the two wings together, which meant that the south had a veto over all New Deal legislation. After 1938, the Southerners composed a majority of the Democrats in Congress because Republicans began to make a comeback as they won Democratic seats in the North. But [the Republicans] did not win Democratic seats in the South. In 1940, every U.S. senator from the South was a Democrat just at the moment when the Republicans had begun to make a comeback in the House and in Senate seats outside the South. The consequence was that, in the 1940s, it wasn’t just that Southern members of Congress could say no to what they didn’t like. They actually were the authors of the preferences that shaped every single legislative outcome in the 1940s. Nothing could be passed into law against the wishes of the Southern members of Congress. And most things that passed into law, especially after 1938 and 1940, matched almost precisely the preferences of the Southern wing of the Democratic Party in Congress. It’s stunning now that segregation was maintained and blacks were excluded from participation in programs such as Social Security, the labor laws, the Civilian Conservation Corps, the Tennessee Valley Authority and others. And when there was a proposal in World War II that all troops overseas regardless of race should be able to vote, the South opposed the bill and Sen. Eastland said “our troops are fighting to maintain white supremacy,” so a bill passed that allowed states to determine who could vote and black soldiers were excluded from voting in segregated states. I would distinguish the arrangements made on the domestic side of politics in the 1930s from those made in the 1940s. In the 1930s, the Southern wing of the Democratic Party was in many ways the most progressive. They came from a dirt-poor region. Only about a third of white and black farmers who lived on the land in the South had running water and electricity together according to the 1930 census. Some Southerners were conservative, but most were on the left provided that the racial order of the South could be protected. They voted with great enthusiasm for the National Industrial Recovery Act, the Wagner Act, the Social Security Act, and so on, but always with the proviso, in the 1930s, that farm workers and maids should be kept out of the legislation; of course, that’s what black people did in the South. Black women who worked for a wage worked as maids in white people’s houses, and African American men who worked for a wage largely worked on the land. But by the late 1930s and early 1940s, even that deal proved insufficient from a white Southern point of view. They became increasingly insecure about their racial order, and this insecurity was reinforced during the Second World War by a war against racism, a war for liberty, a war in which it became ideologically unsustainable to simply justify white supremacy, though they continued to try. Also, this was a period of the rise of a mass labor movement. As it sought to organize in the South, labor threatened the traditional white-dominated racial order. Southerners, as they grew more nervous, began to defect from many of the positions of their fellow Democrats, especially those that concerned labor and labor markets. So, whereas in 1935 the Southerners voted overwhelmingly for the Wagner Act, in 1947 the Southerners -- often the same people -- joined with Republicans to override Harry Truman’s veto of the Taft-Hartley Act, which sharply delimited the organizing capabilities of labor. And they did that because, when they looked at labor issues in the 1940s, they saw those questions not simply as labor versus business, but as harbingers of change to the racial order. Soldier voting is a critical and ill-understood moment. Many histories ignore it. The key there -- it’s almost shocking to remember -- is that in 1944 when so many millions of men were under arms and no one would say they shouldn’t vote, the bill that passed Congress was not the bill that came out of the White House to offer every soldier in the field a federal ballot to mark the name of Dewey or Roosevelt as their preference for president. Obviously, these were soldiers who could not get an absentee ballot. The election took place after D-Day. But the law that passed was co-authored by Senators James Eastland of Mississippi and John Rankin of Mississippi. It was Eastland who got up on the floor of the United States Senate and said, “Our boys are fighting for white supremacy,” and he specifically said his bill was meant to protect it. Then how did it pass? It passed because his proposal was supported by the Republican Party for instrumental reasons because they believed soldiers were going to vote for Roosevelt not Dewey in what otherwise would be a very close election. I believe this marks the first time that a Republican-Southern coalition formed in Congress in which the Republicans moved toward a position held as a principled position by segregationist Democrats. In earlier moments, the Southerners had moved toward principled positions on labor questions of the Republicans, but this is the first time it happened the other way around, and it was the birth of what ultimately became a shift toward the Republican Party in the American South. Many historians see FDR as something of an enigma. He’s seen as charming but duplicitous. What are some of your impressions of FDR? I don’t have a fresh view of FDR. I have the sense, which is not an original one, that he had two overwhelming desires. One was to solve the big problems of the day, and second was to do so in a manner that would get him and fellow Democrats elected and re-elected. He was a first-rate politician who wished to have successful lawmaking. He, as we all know, was able to connect with the American people directly in new ways using the new technology of radio. He was a master at press conferences, which he held frequently. He was a brilliant communicator. Also he was a consummate politician, arm twister, etc. But there’s very little evidence that he cared about the details of public policy, and these got settled in Congress, and because they got settled in Congress, they were settled very heavily by the Southern wing of his party. In consequence, President Roosevelt had little choice in how he dealt with the Southern wing. I don’t see my book as a finger wagging morality tale saying if only President Roosevelt had behaved very differently. I think his scope for choice about the matters I focus on with regard to the South was quite limited -- not perfectly limited, but quite limited. Some historians look at Roosevelt’s years as the beginning of the modern imperial presidency in terms of national security. You can see that tendency in FDR’s efforts to evade Congress as, for example, when he acted to build sentiment for Britain in 1940 and 1941 and when he sent troops to Iceland in 1941. Even as early as 1936 he was authorizing the Federal Bureau of Investigation [to conduct] surveillance on American citizens, then to look for Nazi sympathizers. That’s one of the earliest examples of presidential decision making of a kind that used secrecy, going over the limits of traditional deployment of police powers. The president also twice declared states of emergency, one limited in 1939, one unlimited in 1941, that had no constitutional basis or legislative basis. He effectively used and expanded the category of commander-in-chief and the authority granted the president by the Constitution as commander-in-chief to justify these various activities under the rubric of national security. But I think we must remember that the Congress was a key agent in building and shaping a national security state, especially after the Second World War, with the Atomic Energy Act of 1946, the National Security Act of 1947, and the amendments to the National Security Act in 1949 that fashioned a national security state, much of which lay outside of the ordinary procedures of democratic politics. An example: In 1949, the CIA was given authority to spend its budget without making it accountable to Congress. And there are significant numbers of examples of legislative actions in that period in which Congress did yield -- in the national security area but not elsewhere -- significant powers to the executive. Thank you for sharing your original view of the New Deal. Do you have anything you’d like to add about the book or the resonance of your views as we face vexing challenges today? I’d like to say two things by way of concluding. One is the matter of thinking about the role of the south, which complicates things a bit. If you look at European politics in the 1930s, those countries that moved in authoritarian or fascist directions tended to do so with strong support from regions that were poor, rural and backward, like the American South. And the American South, despite appeals made to it actually by the Nazi regime in the 1930s -- that argued that we’re kindred spirits, we’re all racists together -- stayed inside the game of democratic politics. But not within the region. The region was authoritarian. The region was repressive. The region was charged with violence and even terror, and certainly the system was a system of racial humiliation. But the Southerners in Washington stayed inside the democratic game, both with the lower-case “d,” and within the Democratic Party of the New Deal. In consequence, they were in a position to pass some things like renewing a peacetime draft in 1941, legislation that passed the House of Representatives by just one vote, 203 to 202, without which the country would have been crippled going into the Second World War. So the Southern story has its own inherent complexities, with which, as historians, we should appreciate and analyze. With respect to then as well as today, the book tries to raise questions about moral ambiguity and about the consequences of grappling with fear in ways that step over the boundary of ordinary democratic or constitutional politics. It gives us a framework about choices we have to make in a world that is still fearful. We too live in an age of fear.